I Can Grow Up To Do That?! Funny how the very littlest things can push a kid in the right direction. As it turns out, it doesn’t even need to be on purpose. Who knows? Maybe it doesn’t even have to be born of good intentions. Oh, you say you don’t believe in Providence? Read on. This is a true story. I was born and raised in a small farm town north of Bakersfield, California. It is still there. It’s called “Wasco”. I was born the third kid behind two sisters. My father died 20 October 1956. I was 4 1/2 years old. My mother was 27 years old with 3 small kids to raise and not much in the way of income. She made it happen. Learned to drive a car, got a job, and made it happen. Growing up in Wasco, California, I would often hear stories of the cool stuff happening at the Flight Test Center at Edwards Air Force Base. After all, Wasco and Edwards are both in Kern County. This was the fifties and sixties, the post WWII optimism flood of new jet aircraft, smaller and smaller computers, pushing to the edge of space and beyond, and first times for everything such as the sound barrier. (“What was that! ?” “A sonic boom!”) You want proof we lived in the aerospace age? Look at the fins on the new cars! Looking to the west, I could sometimes see evidence of launches out of Vandenberg Air Force Base. Many were the new Intercontinental Ballistic Missiles such as Atlas, Thor, or Titan. One such launch really sticks in my memory. They released some kind of chemical that turned the entire western sky a weird shade of blue. We heard it was barium. I know that there were tests using barium to explore the ionosphere, so that’s probably what it was. This was before my friends, family, or I might be scared about what this might do to us. This was before I had ever heard of the Utah Downwinders. So it was a pretty neat sky show, all in all. Right at sunset. Using technology from ICBMs, the Space Race was on! I would religiously get up early with my Mom to watch launches from Cape Canaveral. 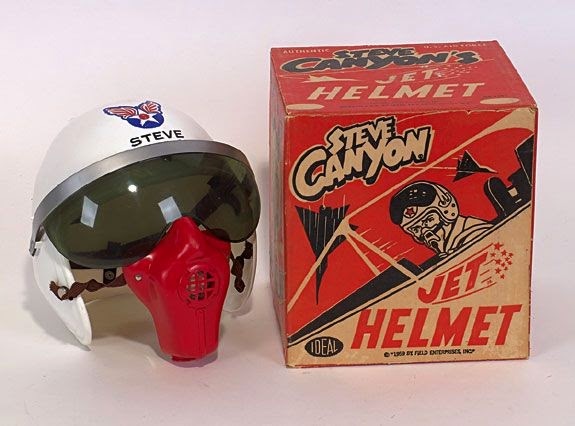 And let’s not forget the hours I spent zooming around the back yard wearing my genuine Steve Canyon helmet! It all merged together in my mind with the Friday Night black & white science fiction theater on TV right after we had finished our meatless Friday fish sticks. These were all impressions. All in the background. Probably not really a lot to do with me personally. I was just a kid from a small farm town. I didn’t really have any life dreams of actually participating in any of this, except in my imagination. Would I fly a jet aircraft someday? Probably just as likely that I would help Professor Quatermass defeat an alien invasion. Then one day, I was walking back from the new church building along the north sidewalk of St. John’s School. I was with a classmate my age and the parish priest. I don’t remember what age. Old enough to be an altar boy, I think. The priest was busy telling my classmate all about the big future that awaited him. There were countless opportunities for him to do whatever he desired in life. He kept saying things along those lines. Pretty much ignoring me, the poor kid. Later, I realized my friend’s Dad was retired military and ran a very successful business. Perhaps that created some of the enthusiasm between the two. Much later my friend said he had been groomed to be molested by that priest. I cannot say from my experience where the truth lies. I was certainly never even approached by that priest. All I can tell you is what happened to me in that moment. The priest gave the equivalent of “um, sure kid”, and went back to trying to generate some enthusiasm in my friend who was quite obviously not buying it. But something had definitely changed in my entire outlook on life. I could be whatever, what ever, WHATEVER I wanted to be. I could do it. I could be, well, if it comes to that, I could be Steve Canyon and fly jet aircraft. If that’s what I wanted to do.